Annoyingly ubiquitous blog-rocker of the moment Wavves (confirmed alcoholic train wreck Nathan Williams, who nevertheless looked sweet and innocent and a little too small for the stage in his skate-rat ballcap), Tuesday at the Bowery Ballroom. I don't know if this San Diego boy is the real thing, but his formula and his hooks, especially on "So Bored" are, and needless to say, I love anyone who obviously has as big a stiffie for Brian Wilson as I do (e.g. 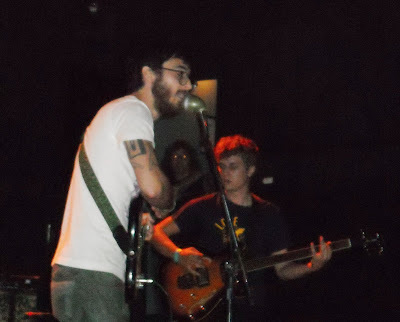 Adam Baker of Annuals). Wilson's influence is what music needs, now and always. Weird Brooklyn openers Woods (singer Jeremy Earl and bassist Kevin Morby pictured above) played louder and more chaotically than their records would suggest, a la Vetiver. They share the same creepy fondness for falsetto as Wavves, and are usually described as some hybrid of "folk," but in my opinion it's only under the most generous definition, in that some sort of acoustic instrument can usually be heard somewhere in the mix of melodic goofiness and experimentation. They make the kind of music that make you want to learn more about the band and where they came from, which is always a good thing. This also might have something to do with the presence of G. Lucas Crane (also of Nonhorse), who, at the Bowery show, knelt on the floor in front of the other members fiddling with the sound board, bobbing his wild blond weave, his head and mouth covered by an apparatus that looked like the most painful orthodontic headgear I've seen. Let me also note that on Tuesday, not for the first time, the lovely doorperson at the Bowery failed to find my name on the list I received confirmation from the publicist that it should have been on. This problem seems to be one unique to the Bowery Presents empire (Mercury Lounge, Music Hall, Terminal 5, etc. ), and unlike most of the truly indie (and I use the word in the conventional sense) venues where usually they can call the band or the manager or whoever to come straighten things out, there seems to be very little one can do about it, unless you have the phone number for your contact readily at hand, which I rarely do. Because of this, I suspect that it's the venue management communication that broke down, rather than the publicist, label, or my editors. This is something that really needs to change if they want anybody reviewing their shows in the future. Not I nor my employer have the funds to shell out $15 at the door every time I write a review a show. This also explains why a real review of this show will probably not appear in its usual spot. I encourage any other poor scribes who've had this experience to speak up. However, this gave me the opportunity for my first live tweet of the show, which you can revisit by clicking the link on the sidebar. Man, I really stuck it to 'em. 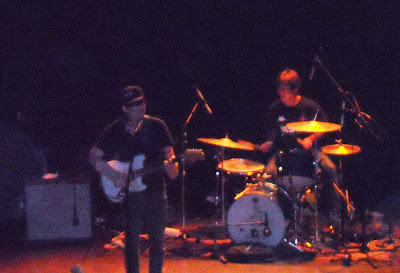 Saw the Wavves a while back and i must admit I love the album and thought they definitely rocked the show. Yeah, despite all the minor annoyances, I enjoyed seeing them live. They're definitely originals. It will be interesting to see in the future whether they can live up to all the blog-hype, though.